Radarcomm has been developing novel wireless RF energy transfer and harvesting prototypes with all components including a smart RF transmitter and a harvester unit with embedded miniature antenna, rectifier, power management circuits, and a storage battery. This project was granted by TUBITAK (Turkish NSF). Engineering prototypes are ready for your customized applications. The module can feed your low power sensor and mobile communication modules, wirelessly. It can be customized for variety of applications such as Smart Grid, Telecom, and Medical, and Defense Industry, etc. Wireless energy is a potential power source for low power communication modules and sensors. Basically, a harvester can be assumed with two main parts: RF circuitry and DC power management circuity. Designing each of the parts has certain challenges. Combining and matching these two parts together to operate as a complete wireless RF harvesting and storage system are another challenges. A holistic approach is required to offer a feasible solution for real world applications. 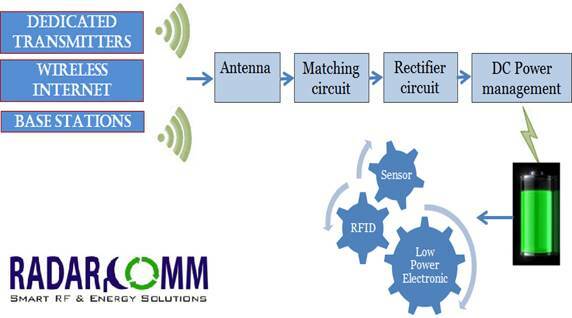 RF energy harvesting can be used for a number of wireless sensor applications, deployed both indoors and outdoors. Applications include ground-level agricultural sensors, HVAC and energy management, automated gauge and meter reading, structural health monitoring, location tracking, distributed pollution sensors, and rotational equipment sensors. RF energy harvesting has great potential to power systems designed for indoor usage such as temperature, motion, and light sensors. Building interiors can often have low-light conditions that make solar energy harvesting methods unreliable or have no-light areas when sensors are located inside walls or above ceilings. Suitable thermal gradients are not likely to be available indoors, and vibrations are hopefully at a minimum. Thousands of watts of energy for HVAC and lighting can be controlled by using a few watts to operate one or more power transmitters, making the potential energy ROI quite significant. By eliminating the labor and cost of battery replacement, the financial ROI for this particular application is also very attractive.